Here are some snazzy birthday facts about 18th of September 1997 that no one tells you about. Don’t wait a minute longer and jump in using the content links below. Average read time of 10 minutes. Enjoy! What day was my birthday Sep 18, 1997? September 18, 1997 was a Thursday and it was the 261st day of the year 1997. It was the 38th Thursday of that year. The next time you can reuse your old 1997 calendar will be in 2025. Both calendars will be exactly the same! This is assuming you are not interested in the dates for Easter and other irregular holidays that are based on a lunisolar calendar. There are 145 days left before your next birthday. You will be 22 years old when that day comes. There have been 7,890 days from the day you were born up to today. If you’ve been sleeping 8 hours daily since birth, then you have slept a total of 2,630 days or 7.20 years. You spent 33% of your life sleeping. Since night and day always follow each other, there were precisely 267 full moons after you were born up to this day. How many of them did you see? The next full moon that you can see will be on May 18 at 21:13:00 GMT – Saturday. Fun stat: Your first one billion seconds (1,000,000,000) will happen sometime on May 27, 2029. If a dog named Floffy - a Xoloitzcuintli breed, was born on the same date as you then it will be 114 dog years old today. A dog’s first human year is equal to 15 dog years. Dogs age differently depending on breed and size. When you reach the age of 6 Floffy will be 42 dog years old. From that point forward a medium-sized dog like Floffy will age 4.5 dog years for every human year. Constantine the Great decisively defeats Licinius in the Battle of Chrysopolis, establishing Constantine’s sole control over the Roman Empire. The 1812 Fire of Moscow dies down after destroying more than three-quarters of the city. Napoleon returns from the Petrovsky Palace to the Moscow Kremlin, spared from the fire. World War I: South African troops land in German South-West Africa. Fritz Pollard becomes the first African American to play professional football for a major team, the Akron Pros. Juan de la Cierva makes the first autogyro crossing of the English Channel. The Mukden Incident gives Japan the pretext to invade and occupy Manchuria. Soyuz 38 carries two cosmonauts (including one Cuban) to Salyut 6 space station. End of pro-democracy uprisings in Myanmar after a bloody military coup by the State Law and Order Restoration Council. Thousands, mostly monks and civilians (primarily students), are killed by the Tatmadaw. An explosion rocks Giant Mine at the height of a labor dispute, killing nine replacement workers. What does my birthday September 18, 1997 mean? 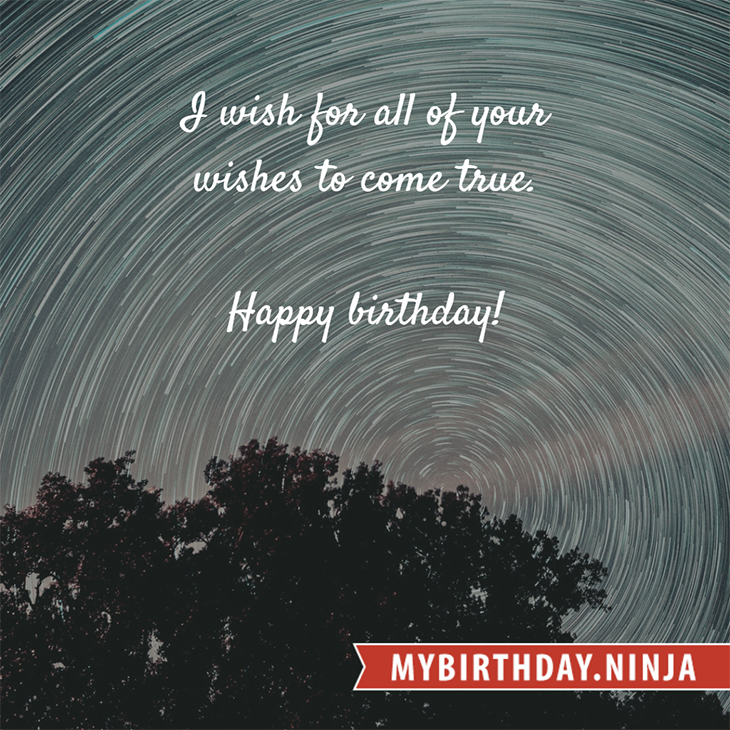 Your birthday numbers 9, 18, and 1997 reveal that your Life Path number is 8. It represents experience, authority and endeavour. You are gifted with natural leadership and the capacity to accumulate great wealth. The following celebrities also have the same life path number: Koyuki, John Madden, Jessica Cleaves, Kay Panabaker, Amy Schumer, Teri Garr, Emma Bell, Laura Michelle Kelly, Amil, Big Joe Turner. 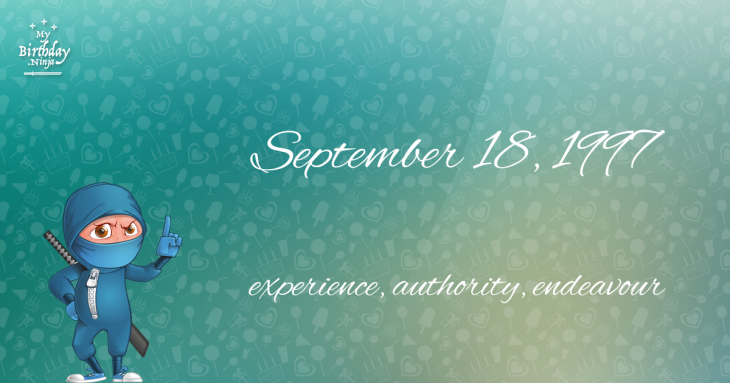 What is the birthday horoscope for Sep 18, 1997? The Western zodiac or sun sign of a person born on September 18 is Virgo ♍ (The Maiden) – a mutable sign with Earth as Western element. The ruling planet is Mercury – the planet of communication. According to the ancient art of Chinese astrology (or Eastern zodiac), Ox is the mythical animal and Fire is the Eastern element of a person born on September 18, 1997. Fun fact: The birth flower for 18th September 1997 is Aster for memory. The number-one hit song in the U.S. at the day of your birth was Honey by Mariah Carey as compiled by Billboard Hot 100 (September 20, 1997). Ask your parents if they know this popular song. How many babies were born on September 18, 1997? Base on the data published by the United Nations Population Division, an estimated 130,906,795 babies were born throughout the world in the year 1997. The estimated number of babies born on 18th September 1997 is 358,649. That’s equivalent to 249 babies every minute. Try to imagine if all of them are crying at the same time. What is the popular baby name on 18 Sep 1997? Here’s a quick list of all the fun birthday facts about September 18, 1997. Celebrities, famous birthdays, historical events, and past life were excluded. Try another birth date of someone you know or try the birthday of these celebrities: March 25, 1982 – Sean Faris, American actor and producer; August 30, 1951 – Jim Paredes, Filipino singer-songwriter and actor (APO Hiking Society); July 26, 1979 – Mageina Tovah, American actress.